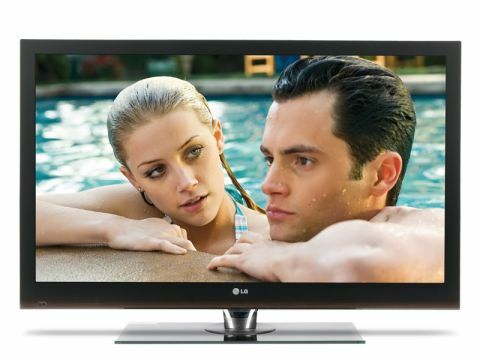 Cast your mind back to our review of the LG 42SL9000. That five-star-bagging set is, to all intents and purposes, the same as the LG 42SL9500 here, except that the latter is exclusive to Currys, while the former is available in other outlets, including Comet. The 42SL9500 is similarly gorgeous with a blade-thin profile encased in a plate-like bezel that fades into transparency at its outermost edge and the whole thing sits on a swivelling stand. Like its stablemate, it's an edge-lit LED model with a 1080p panel driven by LG's much-admired XD Engine processing. The backlight configuration makes the almost improbably slight depth of less than 30mm possible. And into this LG has managed to cram an equally unlikely amount of features. You don't get web widgets, but that's about all that is missing from a roll call that includes Bluetooth connectivity for use with wireless headphones or for transferring such suitable music and picture files to the screen for playback. The image electronics include 100Hz TruMotion digital scanning to smooth over any movement glitches, while an 'Intelligent Sensor' is on hand to monitor the ambient light levels in order to optimise brightness output. The tweaks are sufficiently refined and far-reaching to enable calibration to professional standards, while a pitch-perfect Picture Wizard helps those of a less technical bent set up the screen to their liking without so much as a hint of anxiety. And if you lose the paper manual, LG has thoughtfully uploaded a virtual version into the set's software for your perusal. The 42SL9500, as with all top-line televisions from this manufacturer, is very well connected, with a quartet of HDMI inputs to handle all your hi-def requirements and is joined by all the other digital and analogue regulars, plus an optical digital audio output and a USB port. We're almost weary of telling anyone who will listen just how good LG's current operating system is, but we'll keep on banging the drum on its behalf until someone else invents something better (Philips' gorgeous spectral-blue interface possibly notwithstanding). Everything is arranged under large, attractively rendered tiles that, combined with a peerlessly intuitive architecture, make setup and adjustment about as easy as it could possibly be. There's also a 'quick' menu arranged as a wheel that enables you to cycle through the parts of the system you're likely to need most. You can also assign different picture settings to each input if you want to accommodate the differing demands of, for example, TV and movie viewing. LED is really getting its eye in these days and the 42SL9500 is one of the best we've seen. The colour palette is one of the most lifelike you'll encounter this side of plasma, with a range that can go from dazzlingly dynamic to authentic restraint in a moment, with the sorts of tones that must look absolutely right in order to pass muster (flesh, grass, sky and so forth) handled with apparently effortless fidelity. Blacks are also surprisingly good, particularly if you take the time to adjust the brightness and contrast properly, and the LEDs manage to spread their light evenly across the screen, only occasionally leaving traces of their peripheral presence in conditions of almost total blackout. Movement can jerk slightly now and then, but the LG manages about as well as we've come to expect from LCD and the overall experience, with both standard and high-definition source material, is hugely satisfying. The 42SL9500 pulls off the same neat trick with its audio quality as its sibling, producing a sound that's rich, deep and resonant enough to defy its almost two-dimensional body. The bass levels aren't going to register on the Richter Scale, but it's loud enough to fill a decent-sized room at just a third of the way up and the 'image', if not three dimensional, is spacious and faithful, with a sparkling mid-range and passable cinematic presence when required. Buyers on a budget might balk at the grand-or-so price tag. On the other hand, it's a good a telly as you'll find at any price (and better than plenty of more expensive models); it's got more features than anyone can possibly need and is stunningly attractive. If you can't forgive the Currys exclusivity, buy the nigh-on identical 42SL9000. Otherwise, this 42in LCD television should be at, or at least very close to, the top of your flatscreen shopping list.